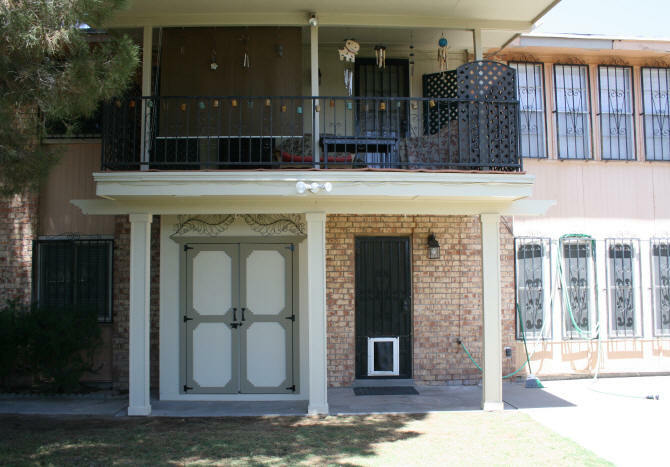 There are three 4" x 8" posts that support the balcony that overlooks the backyard. They were originally, only in need of a new paint job. 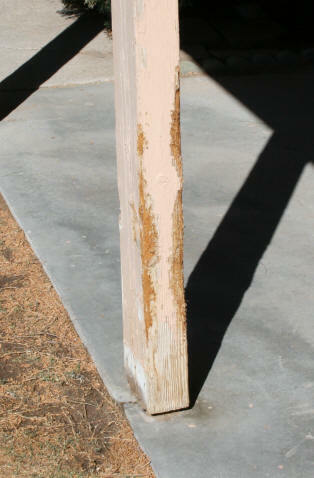 Last year a shelter puppy we adopted took a liking to these wood posts and started gnawing on them. In addition to this, the posts are favorites of the male dogs who love to urinate on them, which means the posts get hosed down frequently. The metal support brackets have also rusted off. See the three posts before the repair below. 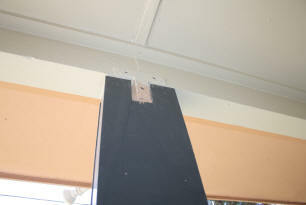 There were the options of replacing the posts or repairing the damage. This would not prevent future damage by the dogs. I decided that the best thing to do would be to cover the post and totally encapsulate the wood from any more weathering and doggie damage. 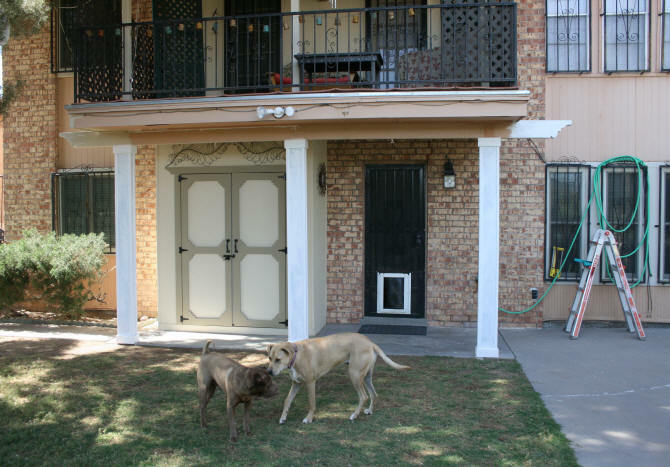 The posts are structurally sound and there is no termite damage. 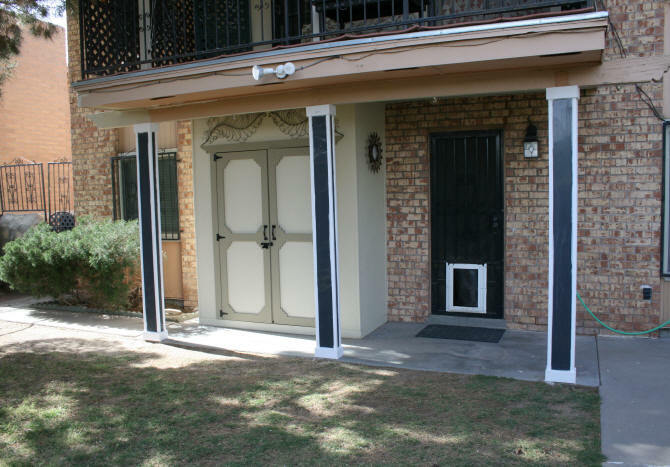 After searching on the web for solutions I came across a line of products called PVC (polyvinyl chloride) column wraps. Yep, same material used for pipes. They come as a kit with snap-in-parts that make covering a column quick and easy. 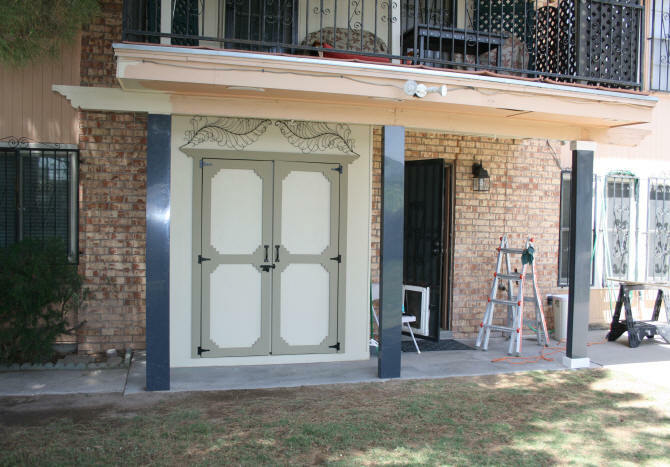 They also look elegant with moulding at the top and bottom. 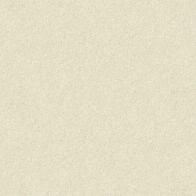 The problem, I quickly discovered, was the size of MY posts. All of the companies that make the column wraps sell square column wraps for square posts. 4" x 4", 6" x 6", 8" x 8", etc. While the 8" x 8" column wraps would have worked for my posts, making my posts any larger than what they are, would be overkill. There is already very little space on the cement patio here. 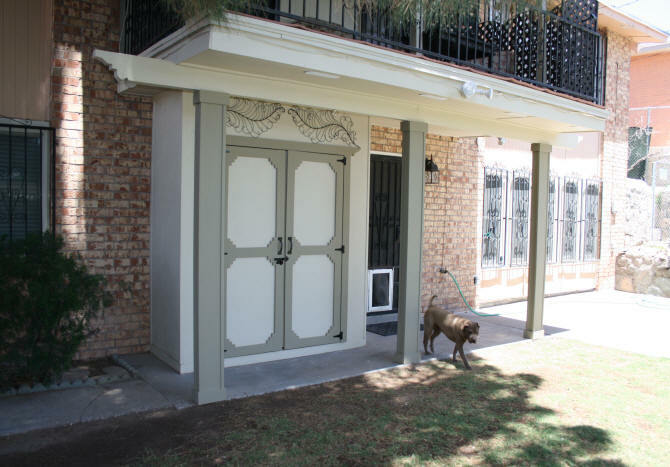 Also, I felt these grand column covers, would just look out of place, on a house that has 4" x 8" posts and beams used throughout. The column wraps were also very pricey. At an average cost of $179 per wrap for an 8" x 8" post. I was looking at about $537 for the three columns. Yikes, too much for my wallet! 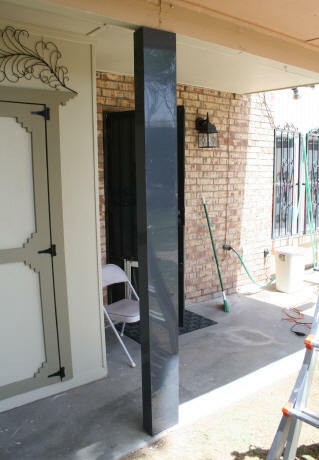 I then came up with the idea of making my own column wraps with PVC sheets. I could cut the sheets with my table saw. Here in El Paso, very few locations carry the PVC sheets. Locally I could get a 4' x 8' x 3/8" thick sheet for $191.93. I needed about 1-1/2 sheets for this project, which means I would still need to purchase 2 full sheets. So this would cost me about $400 with tax and I would still have to cut the PVC sheets myself. Next option was to find a company online that would cut the sheets to the size I needed AND not kill me on the shipping charges. What I discovered was that the smaller the package, the cheaper the shipping. If you ask a company to ship you full sheets, you pay for trucking charges. A smaller size can go through UPS or FedEx. 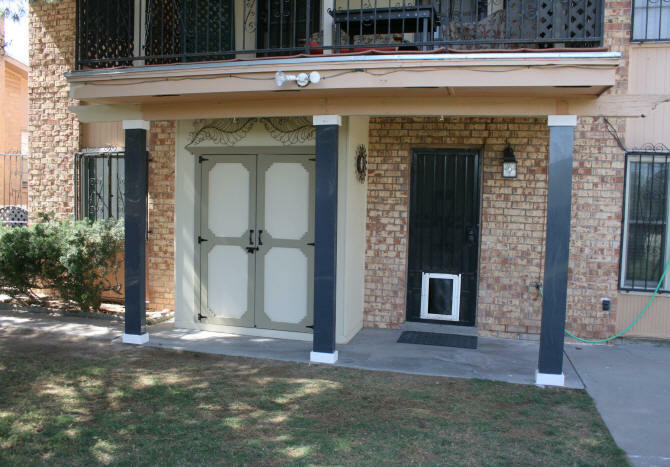 The company I found online was Interstate Plastics which sells gray PVC sheets in a variety of thicknesses and you can have the sheets custom cut to the size you need. Color did not really matter because I will be painting the PVC. I really liked this website because you can play with their price calculator trying different thicknesses and dimensions until you get the price that works for you. Next I needed to determine exactly what size of pieces I needed to get. A 4" x 8" piece of wood is actually around 3 1/4" x 7 1/4". 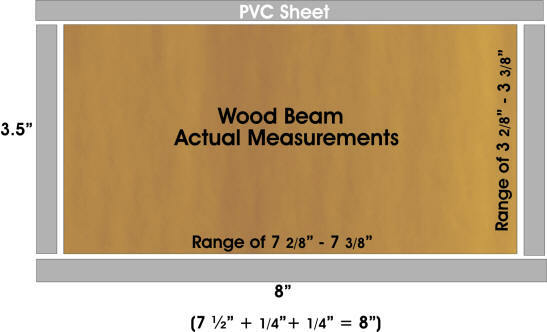 If I just ordered based on a 4" x 8" measurement the PVC sheets would not go snug up against the wood, which is what I wanted AND I would be paying for more material than I needed. So I measured the beams and discovered I actually had a range between 3 1/4" - 3 3/8" and 7 1/4" - 7 3/8". I decided to base my measurements for the PVC on 3 1/2" x 7 1/2", going up a 1/4" inch to be safe and to fit around the T brace which is holding the posts to the cross beam at the top. I then decided on the thickness of PVC I wanted. I really wanted the 1/2" thickness, but the prices really jumped up. I settled on the 1/4" to stay within budget. The company does not do mitered cuts so I also had to settle on putting the wraps together with butted seams. The length I needed was between 91" - 91 1/2". I found on the website calculator, that there was no difference in price between a 92" or 96" length cut, so I ordered the maximum length of 96". I will cut the actual length down with my table saw. I picked up some heavy duty PVC cement at the hardware store for $8.98. The PVC sheet pieces were ordered on April 2, 2014. When I receive the sheets this project will proceed. The PVC sheets arrived in one-eight foot long cardboard box via UPS. The 12 sheets weighed a little over 100 lbs. I opened the box to check on the sheets and to move them from the middle of my garage floor, where the UPS man had placed them. I could not move this box by myself. So I moved a few strips at a time. This material is v-e-r-y slippery. DO NOT step on them, you will fall. I checked the measurements of the strips. The 8" strips were actually 7-7/8". The 3.5" strips were exactly 3.5". The missing 1/8" of an inch on the 8" strip actually worked out OK with me because I had allowed for a little play. Keep this cutting discrepancy in mind, if ordering from this company. I can see why this happened. To cut six exactly 8" strips on a 4' x 8' sheet. You would have to go into a second sheet taking into account the blade width. You would have a piece left over on the first sheet measuring a little over 7". To save on material costs, I can see why the company did this. Perhaps they thought I would not notice the 1/8". Yeh, right! I noticed. So if you need an exact cut ...beware. - Does not crack or shatter. After dropping the sheets or them falling off my table saw onto cement and then whacking them with a hammer. No damage. However, the surface can be scratched. 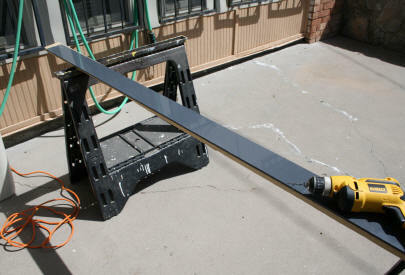 - I was a little afraid to cut down the length I needed on my table saw. It actually cut very easily with my table saw, so I worried for nothing. The edges were not jagged. Remember I only have the 1/4" thickness. I do not know how a table saw will work on this material if it was thicker. - You can drive a nail into it, if you hit it hard enough and hit your nail with even force. It is easier though, to pre-drill your holes. - The material is a dust magnet. 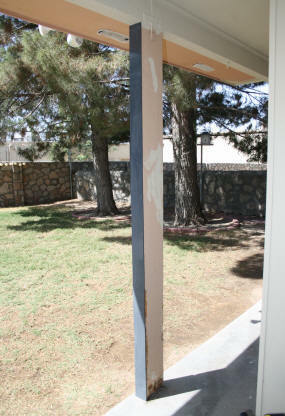 - For painting, you will need to rough up the slick surface with sand paper so the paint will stick to it. I first measured and then cut to size each strip of the PVC. I had varying sizes to deal with, so I had to measure each side on each post. Exact length was not critical because I planned to use moulding at the top and bottom to make caps and bases for the columns. Plan A - The original plan had been to cement the three sides together first. Then slip the PVC over the posts and then put the 4th piece in place. I tried laying down the 8" piece and then gluing the 3.5" pieces onto it with the PVC glue. I even set-up a makeshift jig with 3 sides of wood to keep everything square. This was a bust. The 1/4" thickness was not rigid enough and I could not get a good flat seal. Perhaps with a thicker material, this would work. I had never used PVC cement before. Boy, does it dry fast. Like in seconds. Not enough time to spread the cement then lay the pieces together making sure they are square. 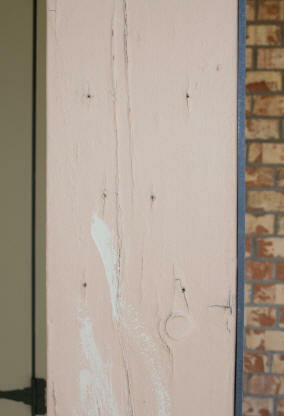 Plan B - Use a product like Liquid Nails to glue the strip to the post. But the tube of Liquid Nails I thought I had, had dried up. Don't count this option out. It just might work, but you would need a lot of clamps or bungee cords to keep the strip in place on the post until the adhesive sets. Or maybe a combination of this and Plan C below. Plan C - Nail the strips to the posts. This did the trick. As mentioned above, I had to pre-drill the holes first. I placed each strip on top of a scrap piece of wood I had set up on a couple of saw horses and drilled the holes all at one time with a small drill bit. I spaced each row of holes about a foot apart. Before placing the strips on the posts I had to remove some rusted metal at the base of two of the posts. Holes drilled in PVC strip The brackets had rusted away. However the metal rod that was inserted in the base of the post into the cement was sound. I then placed a butch of silicone around this metal rod and on the cement were the PVC would sit. I then nailed the PVC strips to the wood with finishing nails. Since the holes were pre-drilled in the PVC, I was only hammering into the wood. So they went up easily. I started at the top and nailed my way down each strip. Making sure the strip was centered on the post at each row. 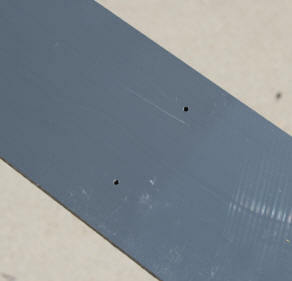 The photos below show the first strip nailed in place and side view showing thickness of the PVC sheet in relation to the post. I then placed the other 3.5" strip onto the post. The photo on the right shows the second strip in place. I then put the outward 8" strip on, making sure it covered the edges of the 3.5" strips equally. Yes, there was some overlap in some areas with the edges hanging over about 1/8" due to the variations in the thickness of the post from wear, paint, and damaged areas. If Plan A had worked, I would not have had the overlap. I could have trimmed the strips but I had already planned to add some outside corner moulding later, so I did not worry too much about the overlap. It took me an entire day to complete the first post, because it was my test subject to work through the steps. The second and third posts only took a few hours after I got into the swing of it. Panel cut at top around the T-brace I did have to make an additional cut for the inside 8" strip to account for the T-brace that holds the column onto the cross beam at the top. If I did not make this cut, the PVC strip would not have laid flat against the post. 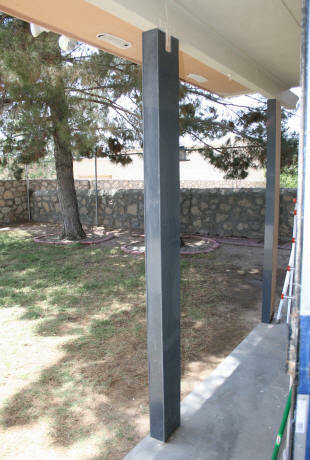 The photo below shows all of the three posts completely covered with the PVC sheet strips. Yep, the posts kind of look like the black monoliths from 2001: A Space Odyssey. At this point, the posts are covered, but I wanted to add a little flair to the columns so I added a base and cap to each column. I used 1" x 4" PVC trim on both areas. I made mitered cuts and nailed each piece into place. This is when I discovered you can nail through the PVC sheets with enough force. It usually took me about two or three hard whacks before I punched through the sheet. Before I placed the base and top moulding on, I again placed a layer of silicone around the base and placed the moulding on top of it, to further water proof it. It is hard to tell on the photo, but the bases do go right up against the edge of the cement. On the post on the far left, in the photo below, it actually hangs over about 1/4". This was another reason I did not want to go with the pre-made square column kits. It would have hung over even more. In the photos above, the posts do not look half bad. But remember I still have the some over lapping edges and the edges are not totally air and water tight. So I picked up some PVC outside corner moulding. Since I was at the hardware store, I picked up some Liquid Nails. After cutting the PVC moulding to size, I glued the corner moulding onto the posts. The corner moulding went up like a charm. I did not even have to clamp it in place. I did run my fingers up and down the moulding several times to make sure it was pressing flush against the columns. I then caulked every single moulding edge top to bottom to get rid of any any gaps. I counter sunk any nails and filled the holes. The posts are now air and water tight. The only thing left to do, is to paint the posts. I plan on using the light green used on the shed on the posts and the darker green on the base and caps. I will first go over the dark gray PVC with some 220 grit sand paper to rough it up a little. I will be using the same oil based primer I have used on the wood, followed by two coats of the latex paint. Hopefully the paint will stick on the shiny surface. First, I need to repair the decorative edge of the crossbeam on the right. I need to strip, repair, and sand the damaged wood before priming. I hate using oil based paint because of the clean-up. So when I prime this wood, I will prime the columns at the same time. 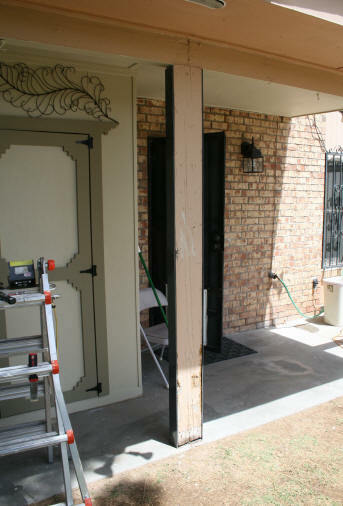 May 6, 2014 - After stripping the old paint off of the decorative beam end and sanding the wood down, I primed this section of the beams and all of the new column covers. It took a couple days to get this beam end ready. The sun hits this area through the entire morning and the early part of the afternoon. 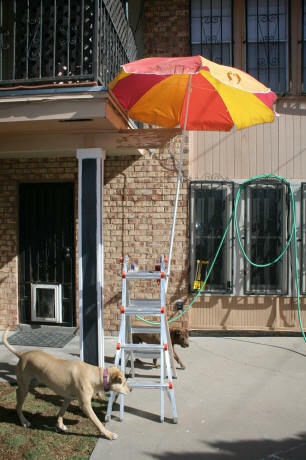 I used an old patio umbrella to shade my head while I scrapped and chipped away at the old paint. The oil exterior primer went on easily on the PVC material. Since I was painting the entire area, a day was spent caulking and scrapping down the other areas in preparation for the overall paint job. 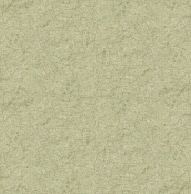 The entire section around the columns and the columns were then painted the light beige/green color. I was originally planning to paint the capitals and bases the dark color but decided to paint the entire column the dark color. 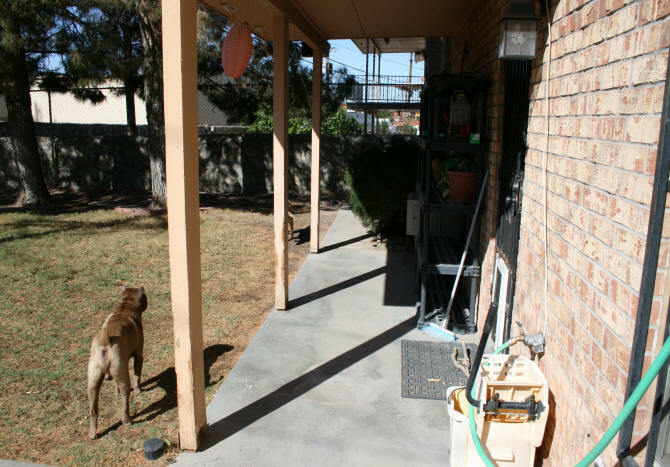 This was after I did some watering and discovered that some of the dirt spattered on the column. 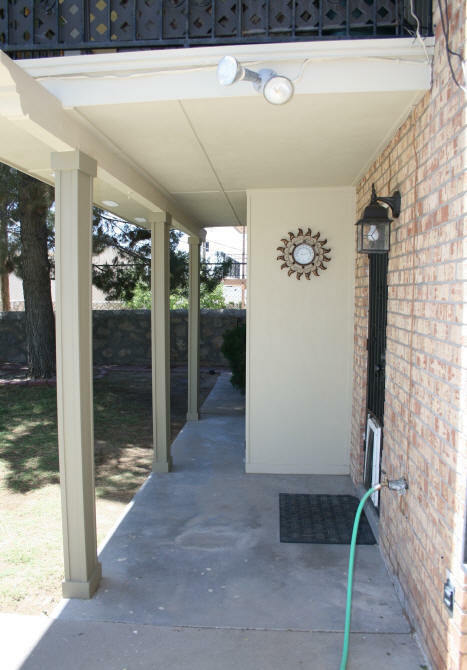 While the dirt was easily brushed off with a broom, I decided the darker color would hide these splatters more. 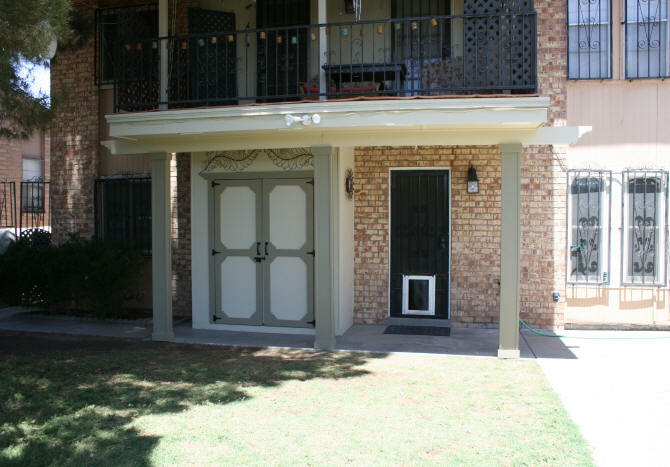 Photos below show the finished paint job. The column wrap project is now complete. I still need to paint the siding which is around the windows at the back of the house. I also need to paint the wood along the roof line. 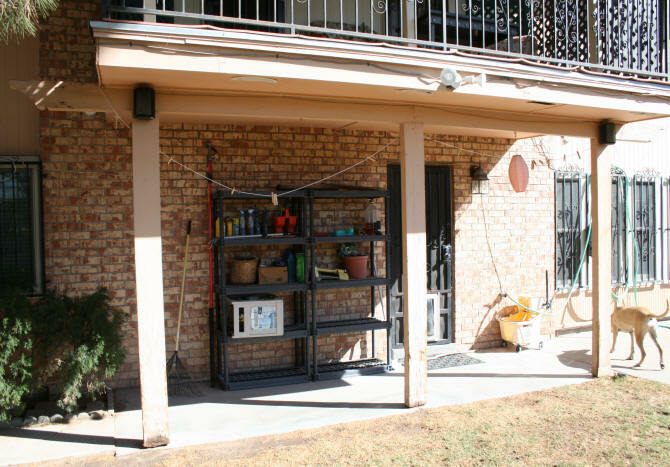 I will need to rent a scaffold or boom to do these areas. The cement also needs to be coated with the anti-slip paint.